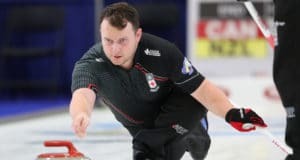 OTTAWA — Jean-Michel Ménard of Quebec cracked open a tight game with three in the ninth end Sunday to get past Adam Casey of Prince Edward Island for his first win at the Tim Hortons Brier. 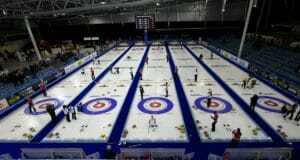 Mike McEwen of Manitoba (2-1; Winnipeg) also used a three-ender – his came in the fifth – to beat Mike Kennedy of New Brunswick (1-2; Grand Falls) 6-3, Brad Gushue made a clutch tapback for a pair in nine to subdue Jamie Koe of Northwest Territories (0-3: Yellowknife) 6-3 and Brad Jacobs of Northern Ontario (3-0; Sault Ste. Marie) stole singles in the second and sixth ends to get past Jim Cotter of B.C. (1-2; Vernon-Kelowna) 5-3. The results left Northern Ontario and Team Canada tied atop the standings at 3-0 with a bunch of teams right on their heels at 2-1. Ménard, third Martin Crête, second Éric Sylvain, lead Philippe Ménard, alternate Pierre Charette and coach Bob Ménard had their hands full with the youthful Casey squad from Charlottetown/Summerside. “He made a whole lot of doubles across the house and a couple of really good setups, especially in the fifth end and we were able to dodge a bullet and force them to one,” said Ménard. P.E.I. was up 2-1 when Ménard scored three in the ninth, an end that looked like Casey might steal until the final skip rocks. Casey’s hit-and-roll over-curled and left the Quebec stone inside the four foot and Ménard followed with a hit-and-stick for the three. The win was especially satisfying for the Quebec team because of the vocal fan support it got throughout the game. “Especially when you’re at home and lots of friends are coming to see,” he said. “I think we’re giving a good show, but no wins to show until now. They’ll be able to get back into the bus for Quebec City saying at least we won a game. McEwen, in his first Brier, said his teammates made pretty much every shot he asked of them, and it took most of them to get past New Brunswick. “They were playing it pretty tight to the chest. They took minimal chances so that’s why it was tight, probably to try to get it down to a three-, four-end game, get a little mistake and maybe sneak one out. Not playing in the evening draw were Pat Simmons and Team Canada (3-0; Calgary), Glenn Howard of Ontario (2-1; Etobicoke), Kevin Koe of Alberta (2-1; Calgary) and Steve Laycock (1-2; Saskatoon). 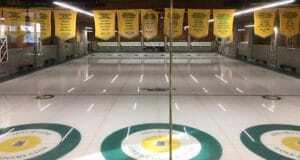 The main round-robin competition begins Friday with draws at 2:30 and 7:30 p.m. ET.